Hello! I am a photojournalist who has been working in Asia and America for over 20 years. A well traveled and established professional photographer, I work for publications that view photography as an important tool for communication. I work in Asia and America covering stories and social issues from a wide variety of angles for publications like Discovery Magazine, National Geographic, Newsweek, People Magazine, Stern, Time, The Los Angeles Times and the San Francisco Chronicle and agencies Bloomberg News and Getty Images. Currently I am the west coast contract photographer for Bloomberg News based in San Francico. Organized, flexible and able to meet deadlines whether on assignment in California or Cambodia, I have an extensive working knowledge of digital photography and can deliver creative images to you from anywhere in the world. I am willing to take on the challenges of going anywhere in any type of condition to produce compelling story-telling images. Currently based in San Francisco with frequent trips to Asia I can be contacted at dpm@davidpaulmorris.com . In the US on mobile + 1 415 637 3455 and in Hong Kong on mobile +852 9446 9313. All of the work on these pages is original and available for publication. Also, I have wide variety of images available for all different types of use. Please have a look at my archive here. Please feel free to contact me with any questions or suggestions. Thanks for your interest in my work. 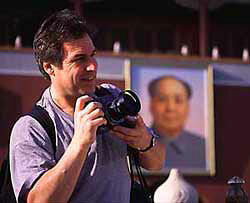 The picture on this page of Mao and me was made by my good friend, travel companion and writer Ron Gluckman .